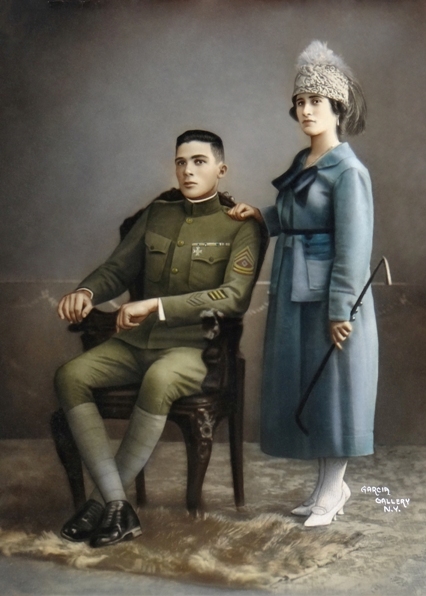 U.S. Army First Sergeant Francisco Valentine-Emeric with his wife, Francisca Valentine (Rico-Gago), circa 1918 in Fort Gulick, Panama Canal Zone. The Lopez-Reyes family is a branch of the Reyes family. The family has a long history of military service spanning several generations, including the Valentine, Privat, Emeric, and Lopez branches of the family. Although the family is now based in New England, Florida, New York, and Texas, it has served the United States Armed Forces around the world, including service in the United States mainland and its overseas territories: California, Hawaii, Louisiana, the Panama Canal Zone, and Puerto Rico. The family has also served abroad, including assignments in Germany, the United Kingdom, and deployments that have included World War I, World War II, Korea, and Vietnam, among others. Service specialties have spanned everything from infantry to intelligence. The Valentine and Lopez branches of the Reyes family share a tradition of public service in the political arena, including active participation in the establishment of a state Republican Party organization and Party auxiliaries in a number of states, support and active involvement in the statehood movement for a US territory, candidacies for and election to local and statewide offices, and other appointed public service roles. The Reyes family continues serving in military, political, and civic responsibilities, as well as in a variety of professions and private sector endeavors. Art, and most specfically photography and music, has become a Reyes family tradition. Members of the family have included a professional photographer, a major motion picture actor, a hip-hop artist, a Radio City Music Hall Rockette, and a disc jockey and host for New York’s WHOM radio statio between the 1950s and 1970s. WHOM is now a New England radio station, transmitting from atop Mount Washington, in New Hampshire. More recent generations of the Reyes family have established themselves in academic careers and endeavors, spanning educational pursuits and educators at universities as diverse as American University in Cairo, Brown University, Burapha Unversity, Dartmouth College, Durham University, Rhode Island College, Texas A&M, Quinnipiac University, University of Connecticut, University of New Hampshire, University of Puerto Rico, University of Rhode Island, and University of Santiago de Compostela. At American University in Cairo’s library, a study table bears an inscription that reads: Nippenowantawem, Mequaunamiinnea… The Lopez-Reyes Family. The phrase “Nippenowantawem, Mequaunamiinnea” is also inscribed at the library at the University of Rhode Island. 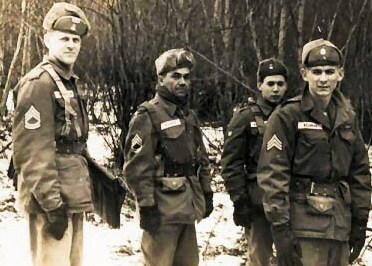 Jesus M. Reyes (United States Army Infantry) in Germany circa 1960. There are several reasons why the phrase is meaningful to the Reyes family and its Lopez branch. These include the family’s ties to Rhode Island, the importance of American indigenous history in Latter-day Saint beliefs (which the Lopez-Reyes family adhere to), admiration for Roger Williams’ pursuit of religious freedom, and the phrase’s reflection of the family’s passionate belief in the study of languages and other cultures. A number of seats in the Bassily Auditorium at the University are inscribed with individual family members’ names as well. The existence of this unique inscription in two parts of the world that mean a great deal to the Reyes family, and most specifically in two institutions where the family has engaged in academic work, symbolizes the circularity of these efforts among family members: the passage of a passion for education from generation to generation and the journey from one academic institution to another in the pursuit of more knowledge. The Reyes family believes firmly in education as a cornerstone for all pursuits and nurtures a life-spanning commitment to academic work.